The Go-Chair is the first travel chair that combines super portability, maneuverability and style at a low cost. Pride has always been known for their excellent full-sized power wheelchairs and great travel-sized scooters. 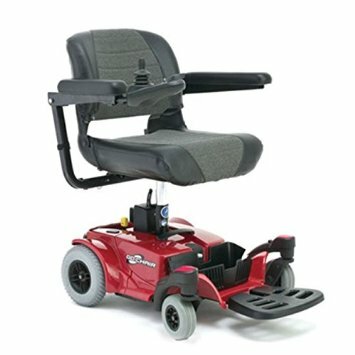 Now you can have the terrific features of both in the Go-Chair!The easy-to-remove battery pack and lightweight frame, the Go-Chair is a great choice to get you going. The portable Go-Chair features a comfortable and roomy 18″ wide and 16″ deep seat. This full sized seat is standard and provides all day comfort. It is also very easy to disassemble for travel and the heaviest piece is just 34 pounds. 29″ Unit Weight: 96 lbs.